Choose the pressure seal format that fits your application. KingSeal Mailers are available in cut sheet, continuous (fanfold), and roll formats, in 11 and 14 inch lengths. The application, printer used to image the data, and the folding/sealing equipment used to process the application determines which size and format you select. KingSeal Mailers are available in three primary fold constructions as detailed below. A three-panel design that provides two panels of enclosed data and one panel for exposed address information. This is the most popular construction since all data is computer imaged on one side of the sheet (simplex), eliminating the need for windows, or two-sided imaging (duplex). Available in 11 and 14 inch lengths. 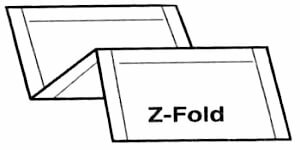 With this Eccentric Z-fold, the sizes of the two panels for enclosed data are increased and equal, and the address panel is shortened. This provides room for additional data. Available in 11 and 14 inch lengths. Provides more data entry space than Z-fold. All three panels of the inside are used for enclosed data, while one panel of the outside is used for address information. 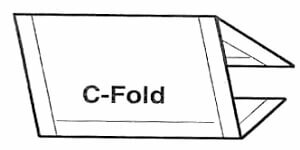 C-Fold constructions require that the computer printer be capable of two-sided imaging (duplexing). Available in 11 and 14 inch lengths. Provides more data entry space than Z-fold. Both panels of the inside are used for enclosed data, while one panel of the outside is used for address information. 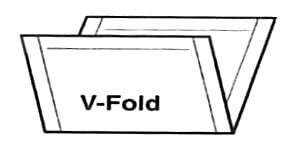 V-fold construction is ideal for applications that appear as a letter since it opens for easier reading, or for two sets of the same data. V-fold constructions require that the computer printer be capable of two-sided imaging (duplexing). Available in 8-1/2 and 11 inch lengths to meet USPS requirements.